A Suffolk lighthouse, which is threatened by coastal erosion, has been switched off for the last time. Trinity House, which owns Orfordness Lighthouse, has fitted a more powerful beam at Southwold Lighthouse further up the coast to compensate. The process of moving mechanical items, mercury and other pollutants is under way. Keith Seaman, the lighthouse's last attendant, predicted it would fall into the sea in about eight years. A lighthouse was first built on Orford Ness shingle spit in 1637 and the current one dates from 1792. The beam was turned on for the last time on the evening of Thursday, 27 June. It has not had a live-in lighthouse keeper since 1965 and has been operated remotely from Harwich, Essex. Mr Seaman, who had the job of visiting the lighthouse to inspect it or fix things, said: "It's a sad end to something I've been associated with since 1994 and that's been there for centuries. "Yesterday, I was filming with a BBC Coast crew and as I locked the door, it occurred to me it would be the last time I did it. "Who knows when the lighthouse will be lost to the sea as it's dependent on the winds, but my guesstimate would be seven to eight years." Pollutants that need to be removed include diesel for the generator and the bath of mercury which the lamp sits in. The lighthouse is on land owned by the National Trust and Trinity House said it was in discussions with the trust and other local bodies about displaying some of the items which would be removed. 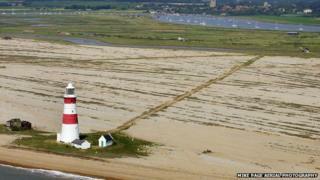 Orfordness Lighthouse: last chance for the public to visit?